Today I am starving. Must be the fall nip in the air or the rain. Whatever it is, I decided it was time to make hummus. I’d bought the ingredients days ago and each time the pantry door opens, they’re calling my name! So here goes! Grab your food processor or blender and get it set up, ready to go. Now gather your ingredients together: 1-2 cans of garbanzo beans, tahini (sesame paste), garlic, spices, parsley, extra virgin olive oil. As you can see from the photo above, I just dumped everything in the food processor. I used just 1 can of garbanzos/chick peas. I forgot to soak the dry beans overnight, so whatever was in the pantry is what I’m using. Drain the liquid from the canned beans into a cup or small glass and set aside. You will want to use some of this later. You’ll need nice pinch of sea salt, about 1/4 tsp cumin, paprika, 4 tsp tahini, several cloves of garlic, fresh chopped parsley or dried parsley, juice of one lime or lemon and extra virgin olive oil. Turn on your food processor and while it’s blending everything together, open the spout and pour your olive oil in. Leave on until smooth and creamy. Pour into a bowl, garnish with a few parsley leaves, sprinkle paprika and drizzle a little olive oil. Here’s the recipe….keep in mind, I do not measure, so measurements are approximate. Adjust to suit your taste. 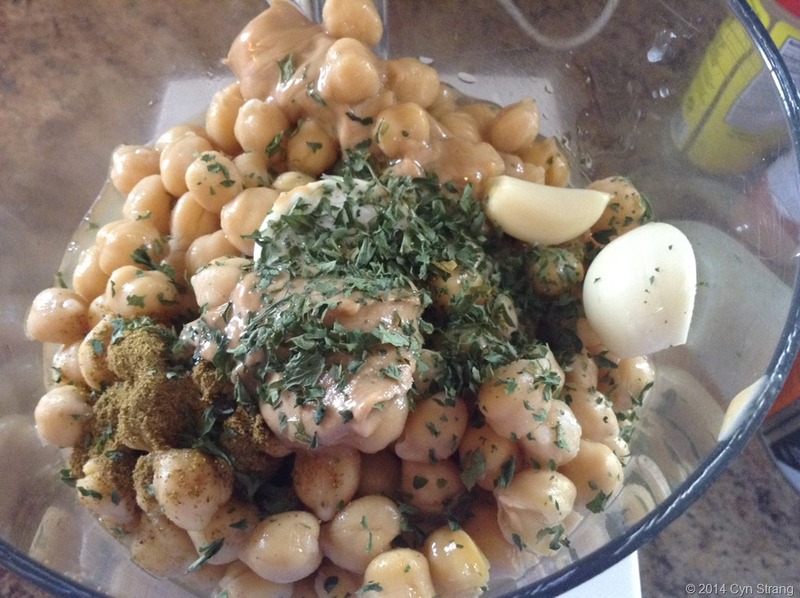 Drain the garbanzos/chick peas into a cup or bowl. Set liquid aside. Rinse the beans in cold water and place into the food processor. Add tahini, garlic, sea salt, cumin, lime/lemon juice, and about 1/2 of the bean liquid. Turn on the food processor and pour the olive oil in it while it runs. When completely combined and smooth, pour into a serving dish. Drizzle with extra virgin olive oil, sprinkle paprika and garnish with parsley leaves. You can also take 3 whole garbanzos/chick peas and arrange in the middle for decoration. 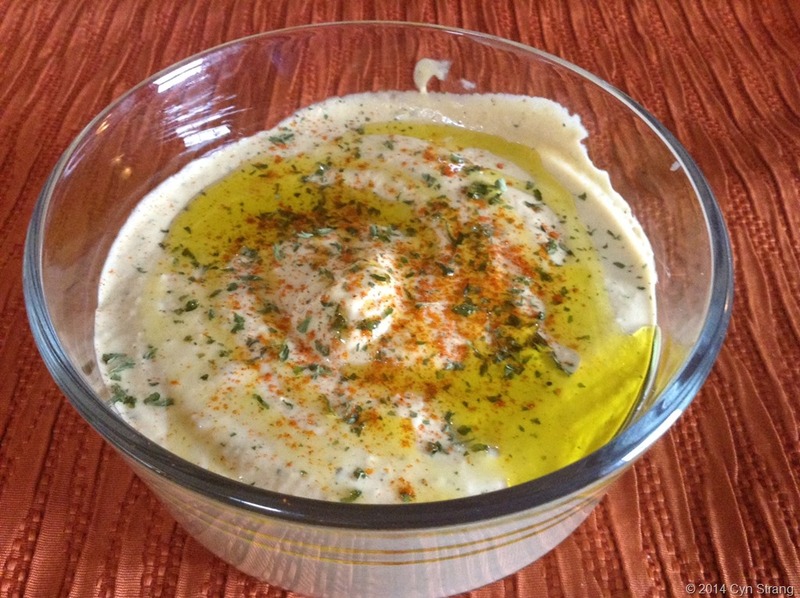 Serve and enjoy as a dip with raw veggies or as a spread for sandwiches on bread or in pita pockets!